Everything you wanted to know about flower girl dresses, baby dresses, princess dresses and SO much more! Kristina Smith shared with us a photo of her charming and lovely daughter Elizabeth! "Our daughter's name is Elizabeth and I ordered this dress for her 5th birthday party. I was very happy with the quality and the price! She was so excited when we gave it to her. She looked and felt like a true princess!! Thank you Nancy August, we will definitely order again!!" Thank you Kristina for sharing your photos with us! Elizabeth looks so darling. We love seeing a happy little customer in a dress that makes her look and feel great! Amazing job with the styling Kristina! That amazing tiara paired with her beautiful brown hair, the pretty dress and the classic black flats makes for a stylish princess. This dress isn't the sort of "classic" or "typical" princess dress, but with the right amount of personality and details, you can create your own princess style just like Elizabeth! This is a look that really works well! Amazing! Elizabeth is wearing our Fuchsia Organza Flower Girl Dress, Item LA574G-FUCH. This adorable dress is totally affordable and available in orange, black, and white as well! This simple, yet sensational style pairs a classic sleeveless bodice with a triple layered skirt! In addition, with this particular dress style you have the option of choosing a sash from a selection of 15 different sash colors! For a little more flair, you can add on a delicate and very pretty organza flower pin available in 17 colors! This is a fantastic dress for your little princess that wants to create her own personally styled outfit, or a flower girl that needs to match the color theme of a wedding! This versatile dress can be worn for so many different occasions all year round. All you have to do is switch out the sash color to go with the season! 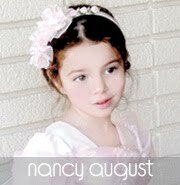 If you would like to be featured on our blog, send us a photo of your little one wearing his or her NancyAugust.com outfit to: Info@NancyAugust.com! Riley in her Red Christmas Dress! Princess Angie Janelle's First Birthday! Chiffon vs. Organza: What’s the Difference?